Last of the season ... are you sure? 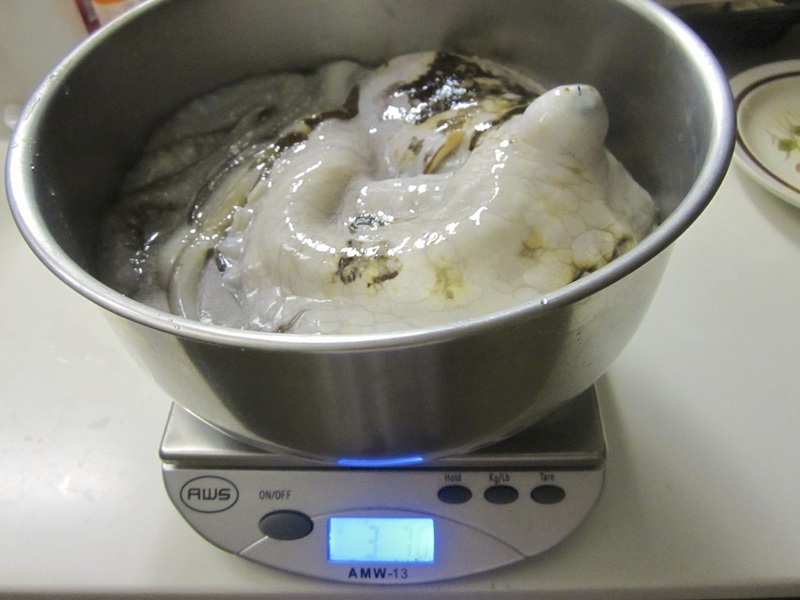 A grand total of 7.5 pounds of fresh tako! ken's triplets, but the fourth one got away!! 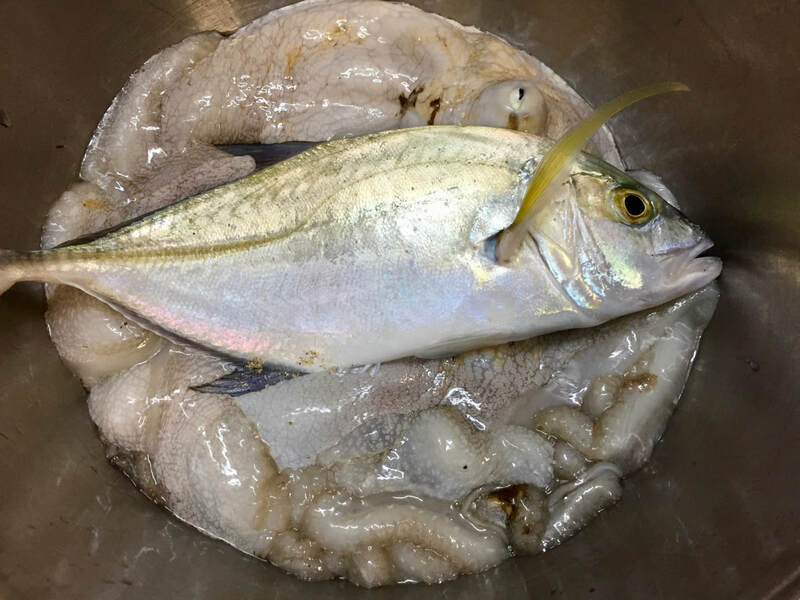 Total catch was slightly over 5 pounds! 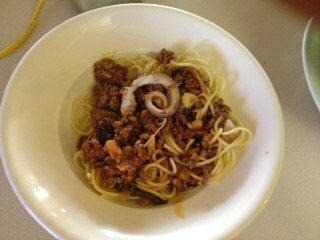 Barracuda was one pound, oh soo yummy! 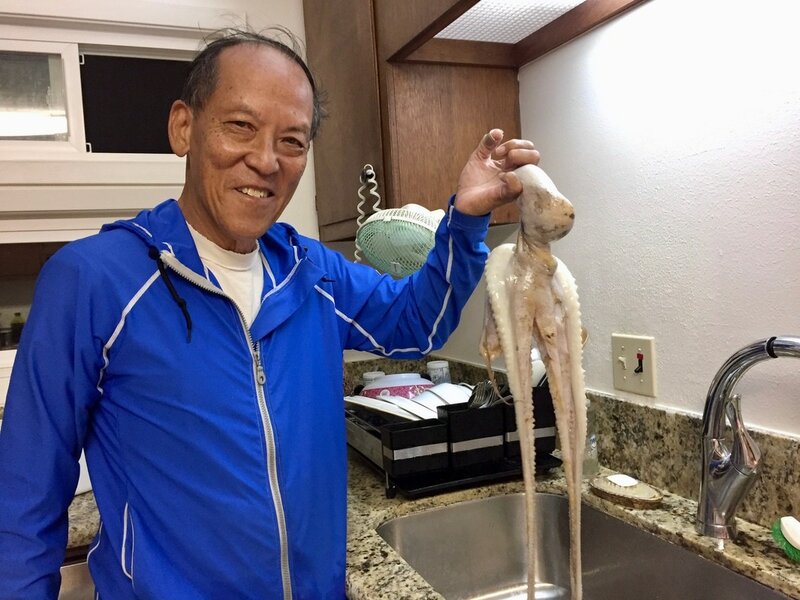 Tako weighed in at 3 pounds... the first of the season! 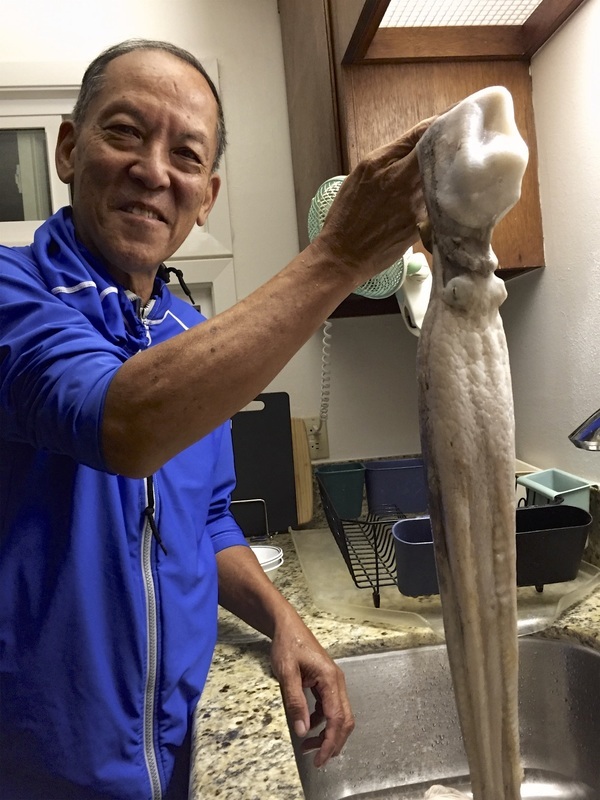 ken was able to snag a septopus this evening, NOT an octopus because this creature was minus one leg! Sometimes big and sometimes small, but so much fun to find them all! 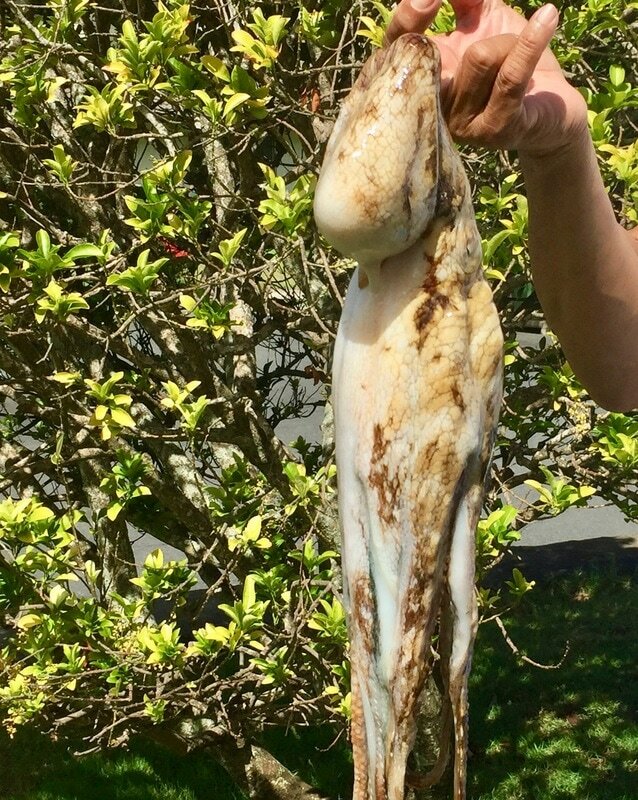 The big one that didn't get away! Oh, for the fun of retirement years! 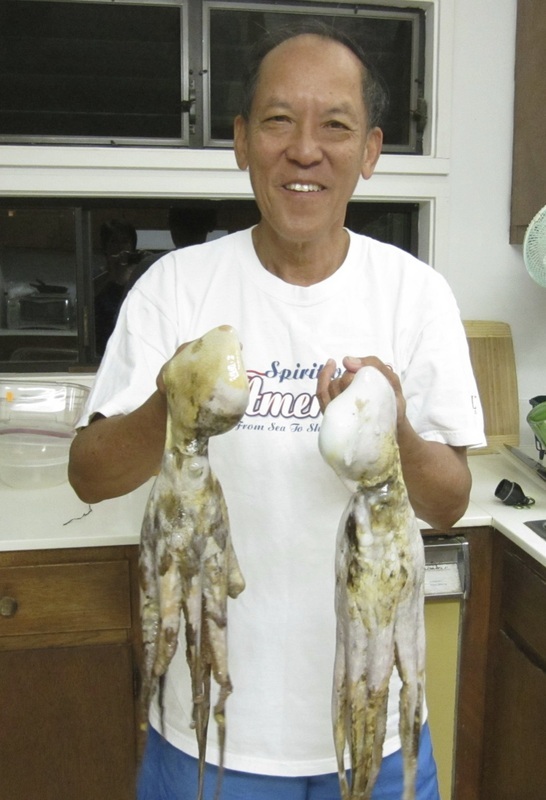 On the spare of the moment Ken abandons his gardening project to go tako'ing with cousin Clyde. 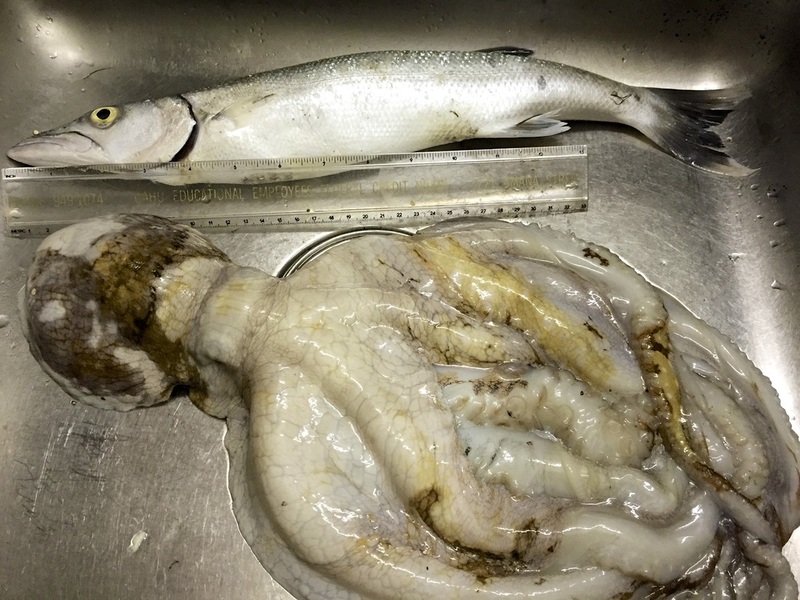 It was a minus tide. And time and tide waits for no man. While the tide was right, the weather was rainy and cold, but they persevered. Just as with Tai Chi, perseverance is the key to success!! 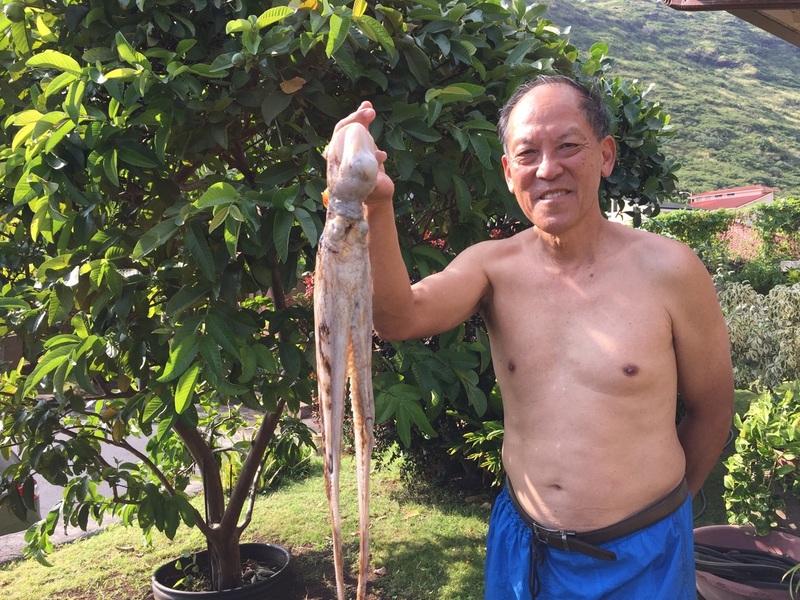 It’s tako season in Hawaii and today was the day that the tako didn’t get away from Victor & Ken. 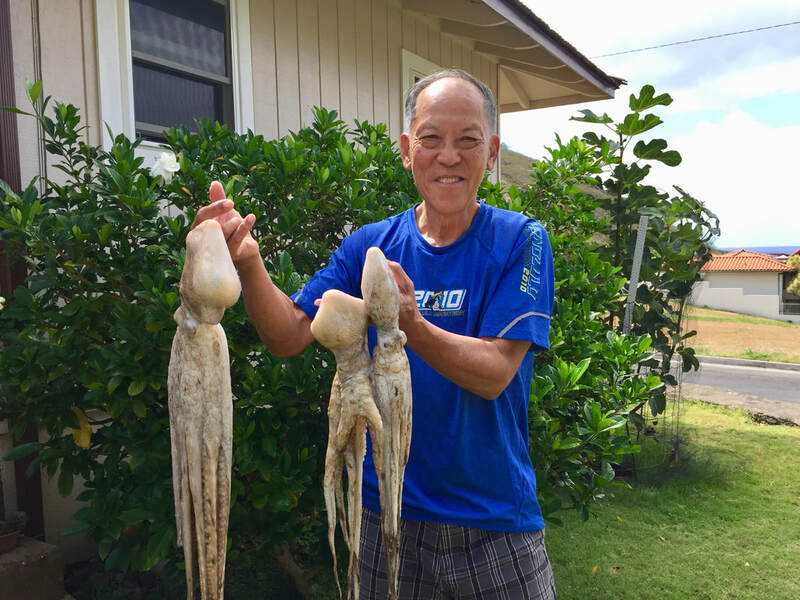 When Tai Chi class is not in session these 2 guys head for the beach to go tako-ing. 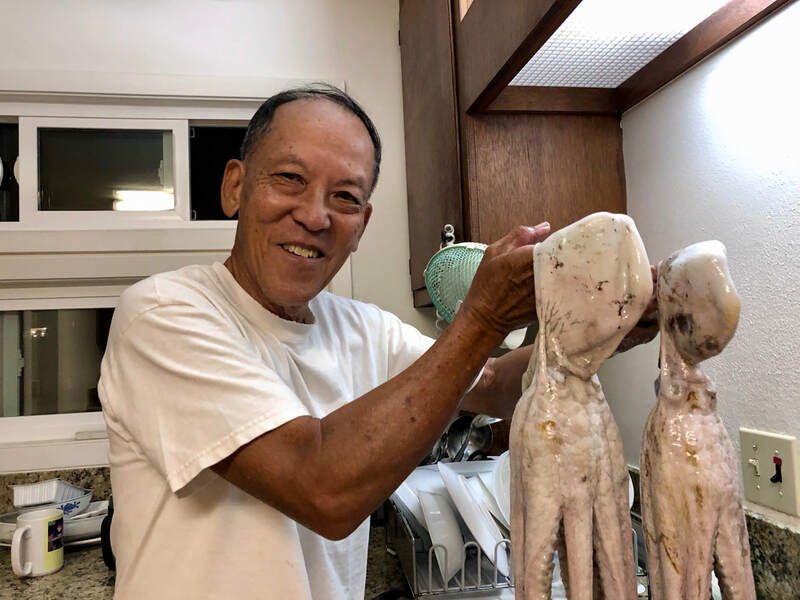 With glass boxes in hand and their mighty spears and of course their octopus eyes they try to spot tako. They lift rocks hoping to find the big one. Most get away, but today was a big success! 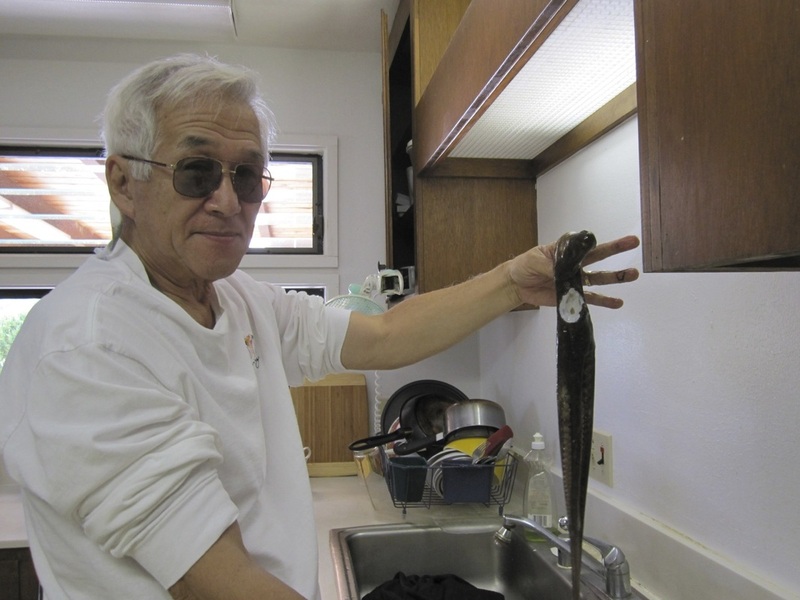 Ken speared it, and Victor grabbed it as it held steadfast to the glass box with its stubborn tentacles. 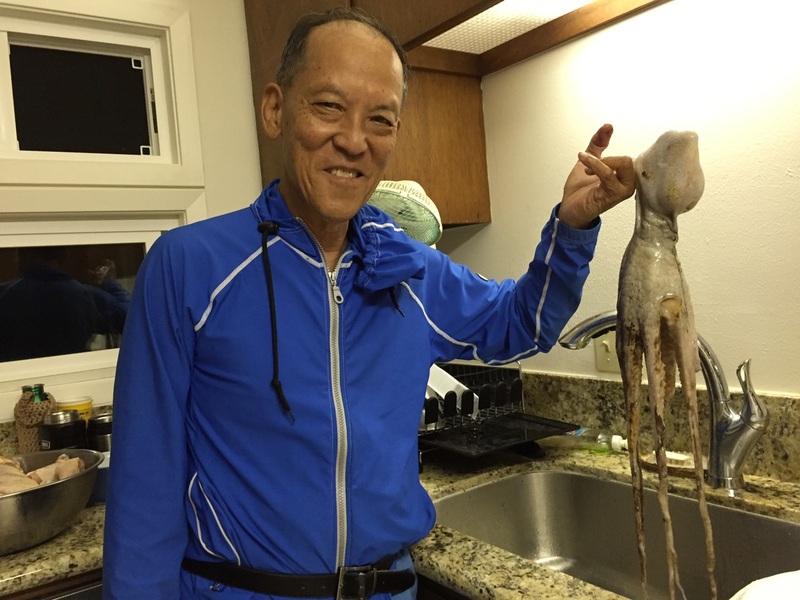 The YouTube video gives you more Tako Tales. PLUS it is educational! 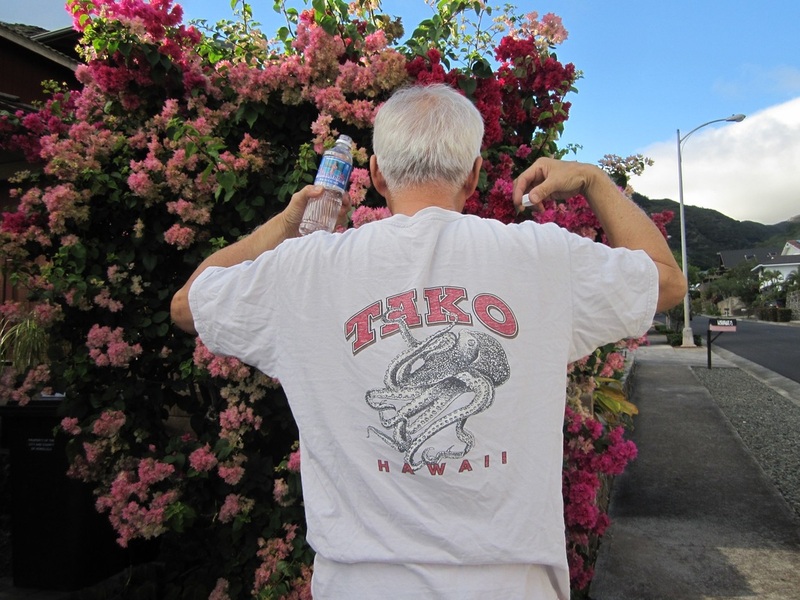 Tai Chi is like the movements of an octopus or tako. Movements are slow, continuous, smooth, slithering and gliding, quiet and soft and steady. Here is the advance, graduate level online course this time!! 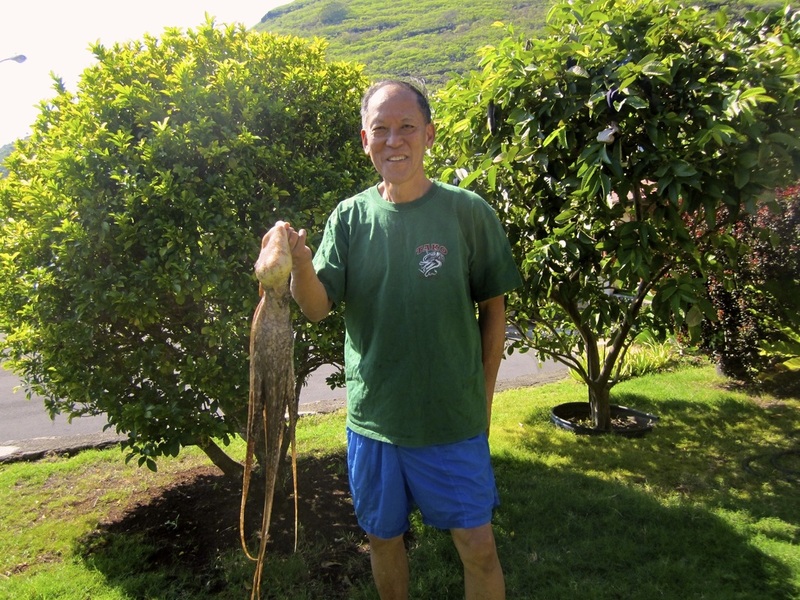 Victor and Ken were again out on the beach Tako-ing after Tai Chi on Tuesday. 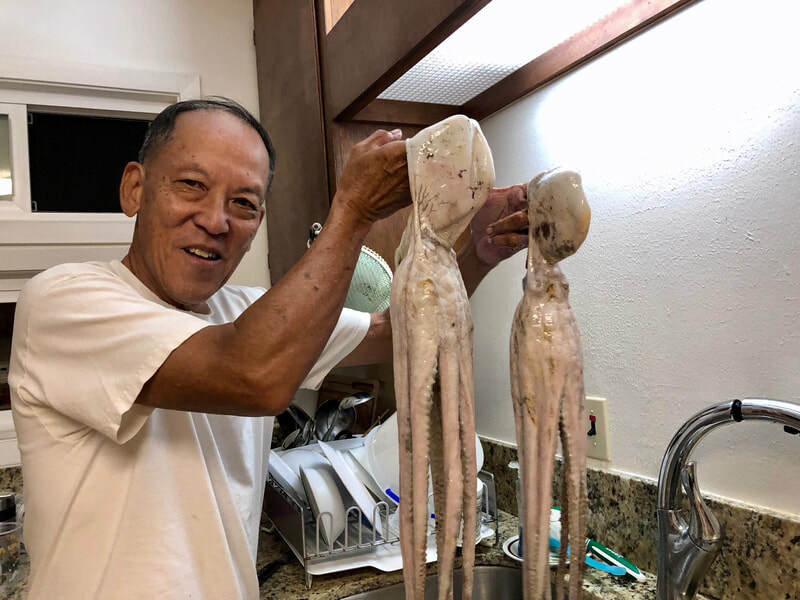 It was only after feeling relaxed and focused that they decided to exercise their Tako-ing skills. 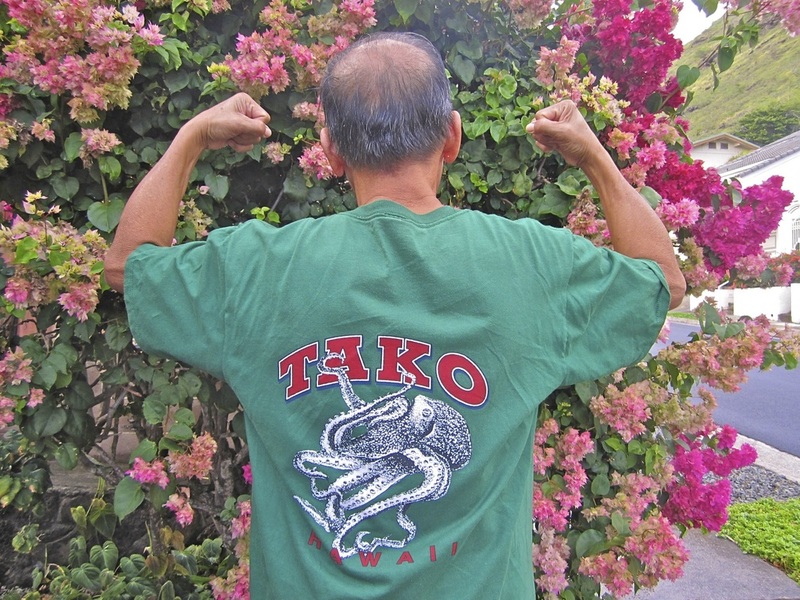 Like Tai Chi, Tako-ing requires practice with diligence and patience. It all paid off. Go to YouTube and see their big catch. For sure, it’s waaay bigger and heavier this time. 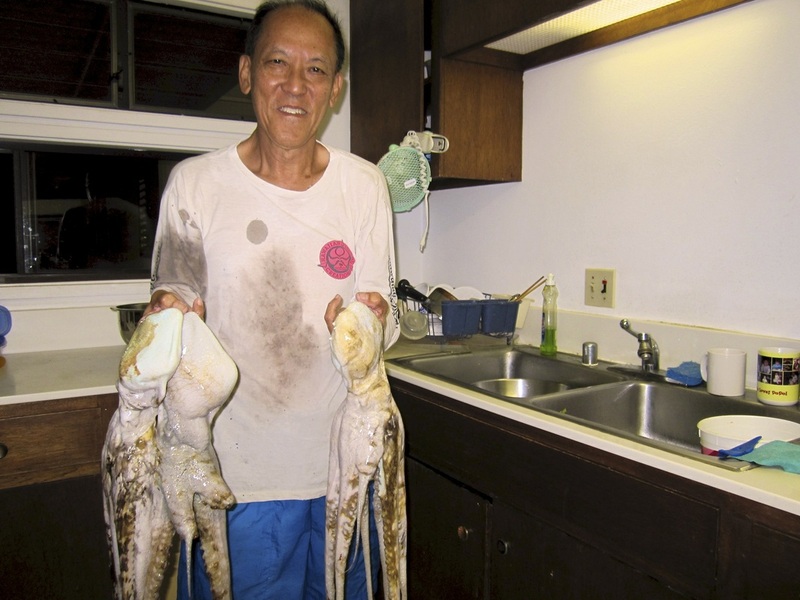 True to a fisherman’s tale, it continues to grow with each time you hear the story. It started out as a 3 pounder, but how could that be? 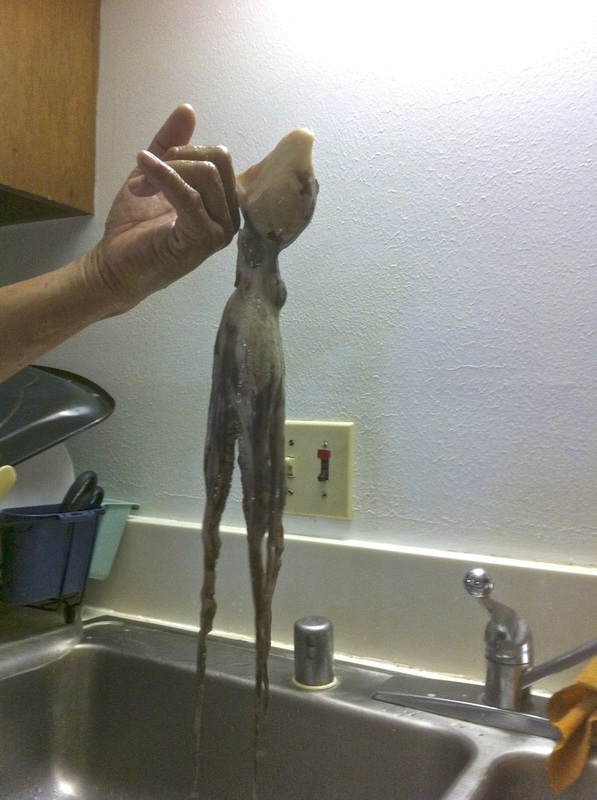 It’s at least 10 times the size of Tako 100. So it’s gotta be at least 6 pounds to be on the safe side!! 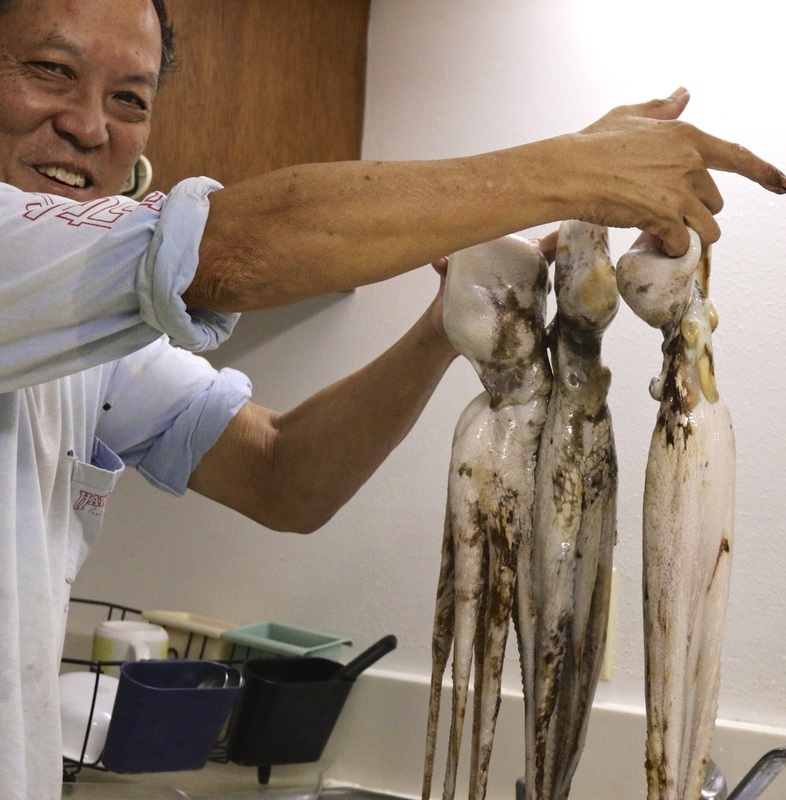 Victor spotted the octopus’ eye, took a closer look and saw the tentacles. Got all excited knowing it was big. Yelled for Ken. Victor speared it. To secure it, Ken speared it too. Both guys tried twisting their spears, hoping to pry it out of its hiding place. But, no luck. Victor used his Flash Arms movement and rubber banded it accurately and went for its head. 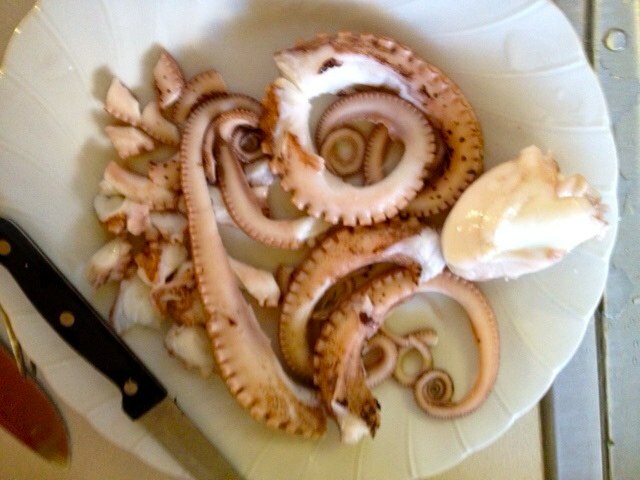 Of course, this made the Tako very stubborn. 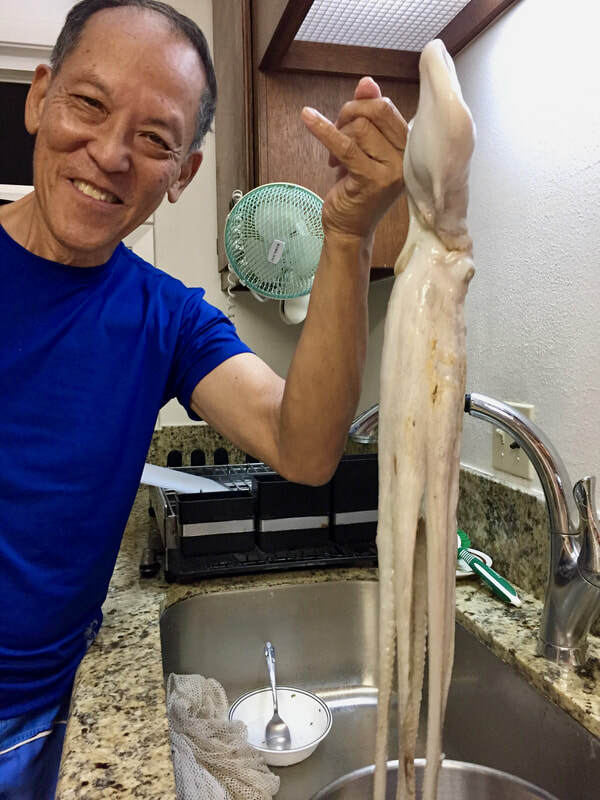 Instead of finding the Needle at the Bottom of the Sea, it was definitely spearing the Tako out of his home at the bottom of the sea. 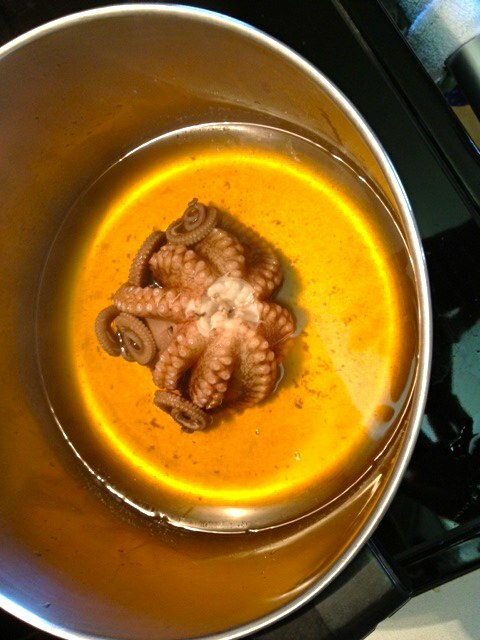 The octopus was very stubborn. He shot back and sprayed its ink. The guys, determined not be beaten, grabbed it with their quick reflexes. 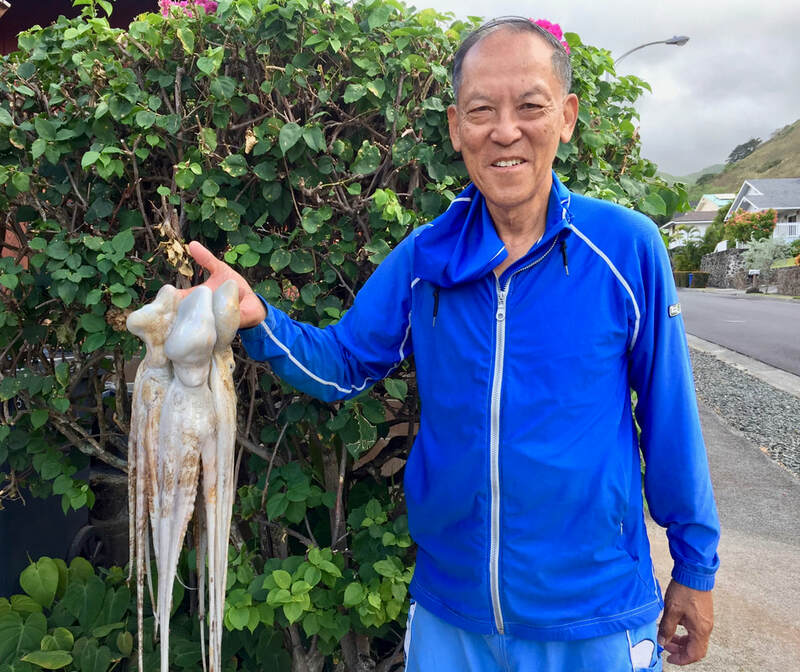 Two old men were fighting with the octopus, attempting to remove their spears, hoping not to let the octopus escape, and outsmarting the poor Tako. 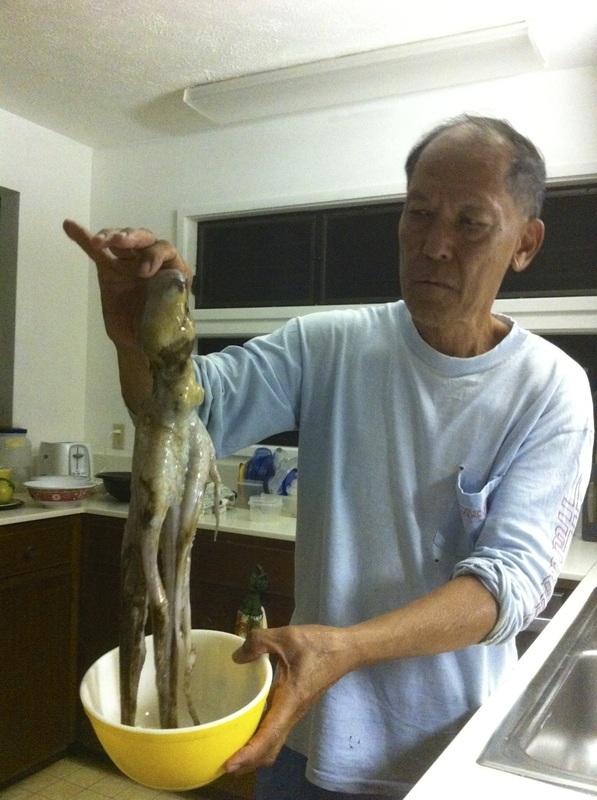 Then with force, the Tako rapidly clenched onto their glass box with his ever ready suction of its tentacles. 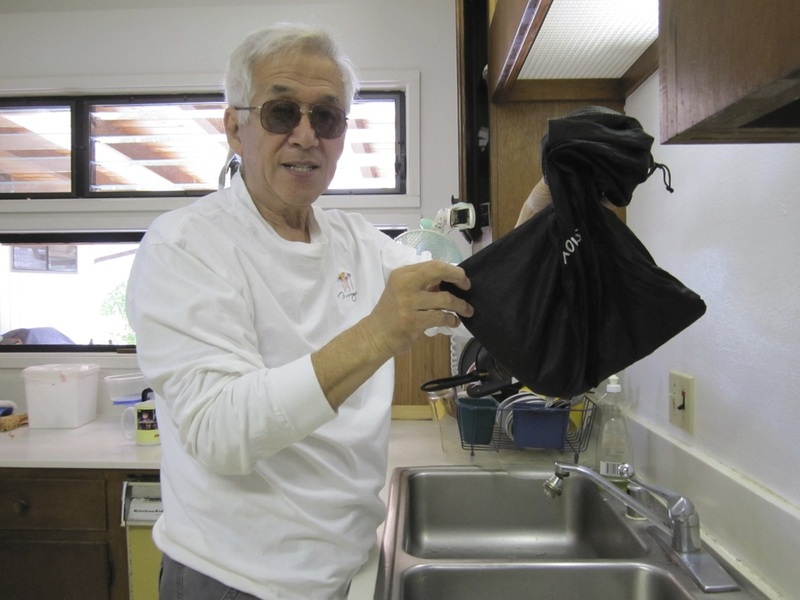 Eventually, Victor and Ken, through team work, concentration, and a sense of calm, methodically worked it out. 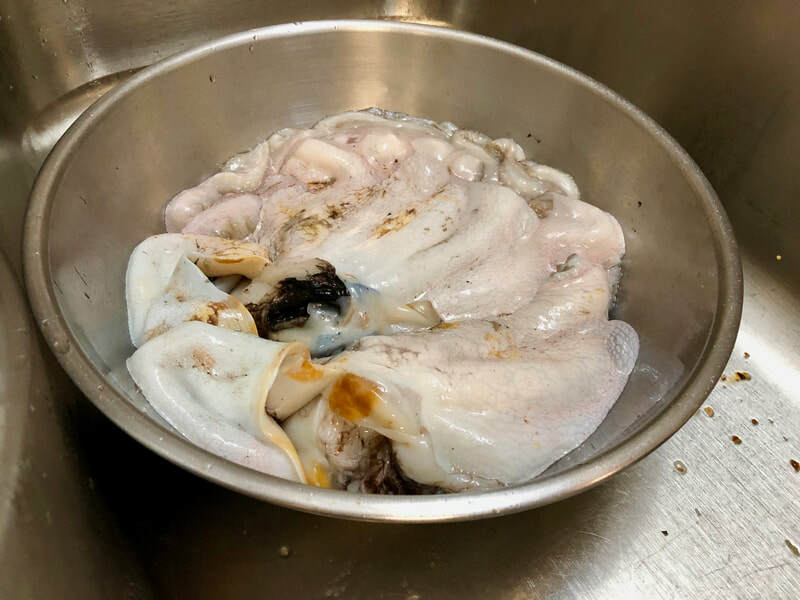 They were able to get to Closing Form with the Tako, at last, in the bag. 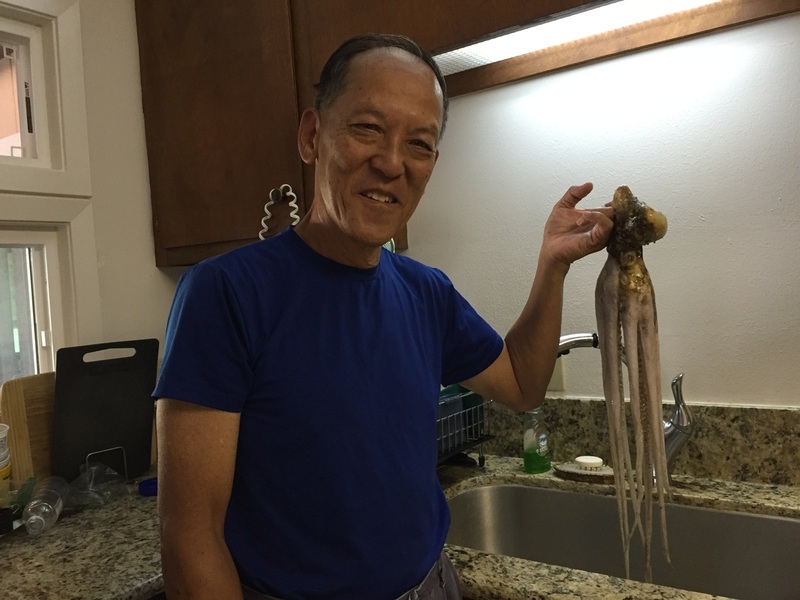 Tako Tales 101B is an online refresher course on how this nearly 2 pound Tako was caught single handedly. 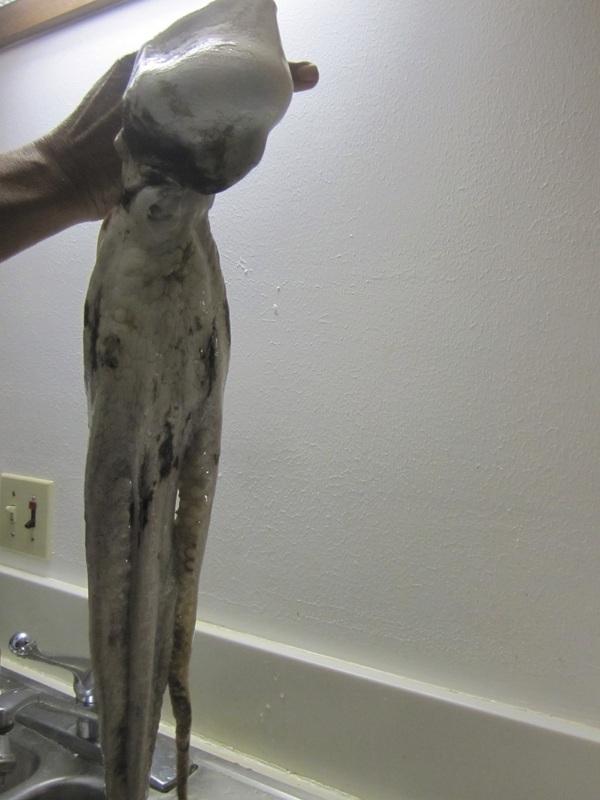 Understand why it is called a “septopus”, not your usual octopus. 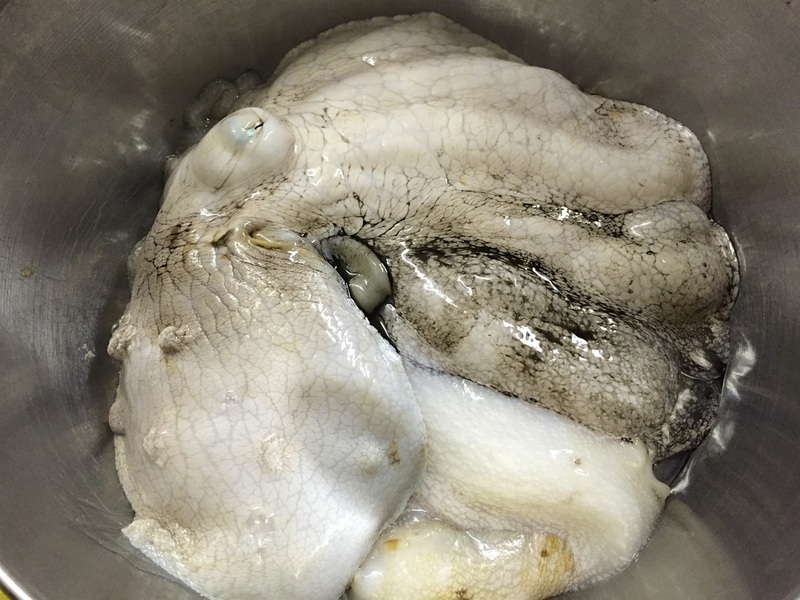 Hear it from the Tako experts. 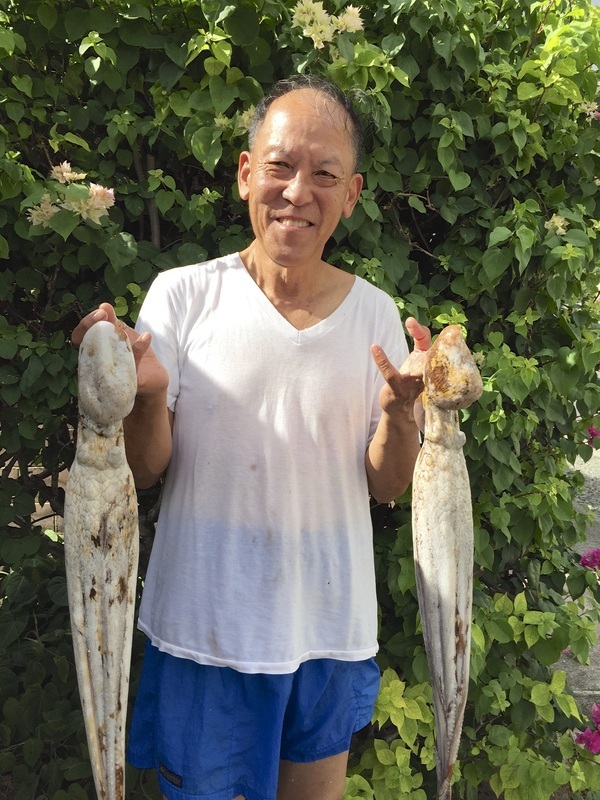 Victor gives you the details of his Catch for the Day. 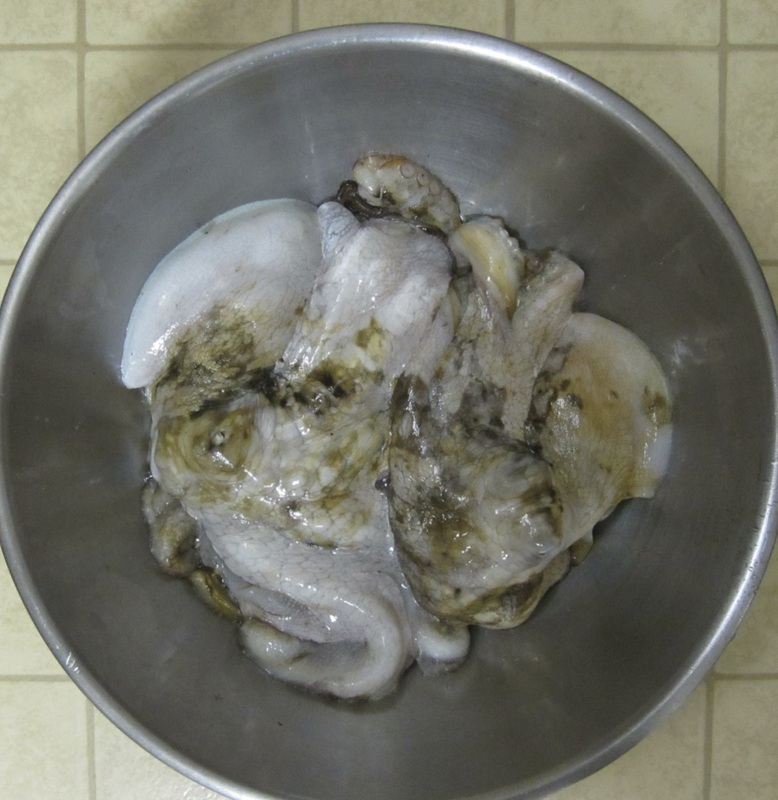 The YouTube video also goes in detail in how to prepare tako for eating. 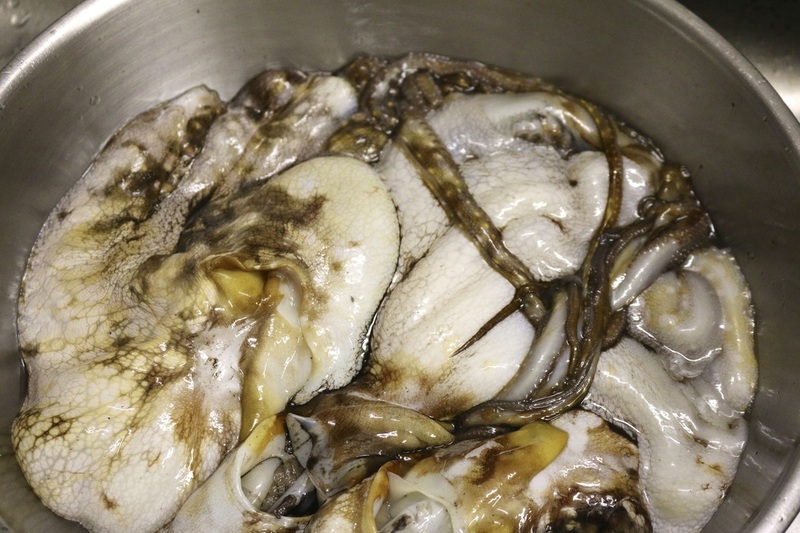 Learn the steps in cleaning it from its slimy skin to the dissecting of it’s body parts. This is another example of a how we learn from each other and enjoy nature and the company of others.